Pharmacy education and assessment has changed rapidly in recent years to meet the growing requirements of clinical practice and regulation. In 2011, the General Pharmaceutical Council (GPhC) published ‘Future pharmacists: Standards for the initial education and training of pharmacists’. This document provides Schools of Pharmacy with ten standards that must be met in order to gain accreditation. The document stipulates that curricula must be integrated and progressive, dealing with issues in an increasing more complex way until the right level of understanding is reached. Assessment methods employed by the School of Pharmacy must measure the outcomes in Standard 10. These outcomes centre around many competencies required in clinical practice but also recognise the scientific basis of the MPharm degree which underpins our knowledge and understanding of all medicinal products and is one of the unique selling points of the pharmacist. The integration of science and practice is crucial in both teaching and assessment of the MPharm. 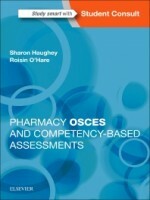 Schools of Pharmacy have developed OSCEs in order to assess the clinical competencies that are difficult to determine using traditional pen and paper examinations. This book will introduce students to the main Pharmacy OSCE topics which test communication, practical and problem solving skills. Example stations will be written in detail so that students can practise and then check or score their performance against model answers. This book will also include examples of competency-based assessments which are designed to assess the level of integration between science and practice. To date no publication exists which explores or describes this type of assessment in detail. Students can use the station examples to test their ability to integrate their knowledge and skills. Application of scientific understanding will be tested within a clinical context and this type of assessment is likely to be adopted throughout the UK schools in order to meet the demands of the regulator. The content of the book will reflect the key competencies necessary to practice pharmacy and to demonstrate integration of science and practice. Each chapter will comprise a short introduction on how to tackle the type of problems encountered in the chapter.